This is the confession of Dennis Galimzyanov. In this handwritten letter dated today the rider admits to his team that he took banned substances and waives his right to the B-sample being tested. He states that he acted alone, even using capital letters to help emphasise nobody from the Katusha team was involved. However the matter isn’t finished. There’s the formal process of imposing a ban. If the letter is accepted by Russian Cycling and the UCI then a confession is equal to a positive test and he’ll be banned for two years. Sacha Modolo (Colnago-CSF) now “wins” Stage 1 of the Circuit de la Sarthe. For Galimzyanov there are more questions, namely whether he acted alone or if anyone else was involved. He says in the letter he’s ready to face punishment but is he ready to co-operate? From whom did he buy the EPO? How did he learn about injections? Did anyone explain the dosages involved? Where did he consume the banned substance, was he at home or a training camp? Did he use EPO before? It is rare for a rider to act totally alone here. Katusha had tried a contract where riders caught doping were supposed to pay back a multiple of their salary. But I think this was invalid to start with and probably unenforceable so at least Galimzyanov should avoid this. Away from the 25 year old rider there are questions for the Katusha team and its management as well. Teams should prove support and coaching to help ensure riders are clean and whilst squads are not there as parent for childish riders, if riders are doping then it suggests the team environment can be improved. Especially since teams monitor their riders health and blood levels from time to time. Worse for Katusha, the team’s got some questionable leaders. As I mentioned yesterday, even being charitable the team manager Hans-Michael Holczer seemed careless, ignorant or naive when he was in charge of the Gerolsteiner team when several riders under his watch were caught doping; and that’s assuming he wasn’t actively part of this. On the medical and sports science side the Katusha team’s head doctor Andrei Mikhailov is a convicted criminal with a prison sentence for doping. 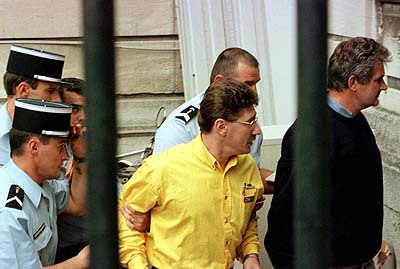 We go back to 1998 when he was caught by French police who discovered a van with large quantities of EPO inside and given a suspended prison sentence and a large fine. He claimed to be on a mercy mission, that the EPO was actually destined for a hospital in Russia but the judge didn’t believe him. Still, this was a long time ago and perhaps everyone deserves a second chance? It’s unusual to see a confession, we’re more used to brazen denials. Galimzyanov was tested, caught and will now be banned. But if handwritten letters are rare these days, doping totally alone is even more rare. It’ll be interesting to see if we learn more about how Galimzyanov acquired the banned substance and where he learned to abuse it. It’s good to catch the cheat but we often lose sight of the supply chain in the background. This is Katusha’s third EPO positive after Christian Pfannberger and Toni Colom. These could all be “lone wolf” stories but the team would do well to see if it can offer a more supportive environment for clean riding. Sadly, with Holczer and Mikhailov in charge I struggle a bit to see the commitment. But that’s my problem to deal with. It’s good that he’s ‘fessed up, but does he hope or expect that this draws a line under the case? I’m not keen on conspiracy theories, but it would seem that this confession gives people the option to sweep the case under the carpet without digging too deeply into who he was working with. I am guessing that this confession letter was not voluntary. Sorry – you are dealing with a Russian team. Hell – the entire wealth of oligarchs were obtained through coercion, corruption, bribes and manipulation of the political process and media to get where they are today. Something doesn’t feel right here. If I read you right, Why does he send a letter to the team to confess that he acted alone? Good question, I suppose the team don’t need to be told he was acting alone. But the letter is a communications device for the wider media. Thinking aloud I suppose the team have prompted him into this because if he goes down, the team just can’t afford any more bad publicity here. This whole thing stinks to high heaven. Reminds me more of a Soviet show trial than anything else. Other than the points already raised in the blog post, why would a rider be using EPO in this day and age when there is a test for it? Nothing here makes sense at all. Read the NYVelocity interview with Michael Ashenden, he explains it very well. Basically EPO (in microdoses) can be used to mask blood doping rather than as a performance enhancer in its own right. Seems rather unlikely that a rider acting alone, with no team support, would be dealing with EPO microdoses to mask blood doping. Paul I. – I completely agree. This raises lots of alarm bells. We need to keep in mind – this is not some small Canadian team..this is a squad devoted to promoting and developing Russian cycling, and the main sponsor is, to put it mildly, corrupt. Hear no evil, see no evil, speak no evil (as noted by the Inner Ring yesterday). Careful with the “Soviet stereotypes”. I know the team is named after a patriotic song from those times but perhaps we’ve all been reading/watching too many spy novels/films? That said the team clearly has a unique attitude. The sponsor is in it for the long term and doesn’t have the same risk averse stance that might have made others quit the sport by now. Forget spy novels….between Yushchenko and Alexander Litvinenko (London poison victim), it seems clear to me that one does not go against the powerful in Russia without risking one’s health and life (much less the career that likely would be denied by Galimzyanov). Not saying anyone was threatened with death, but this letter is nonsensical given its timing. Let me ask you this….what would motivate such a letter before the “B” sample would come out? I mean, this letter could have come out later, after everyone let the process run its course. It seems to me that this has all the trappings of a forced confession as Katusha (and due to the inter-relationship as well as permissiveness of the UCI with respect to this squad) the UCI trying to get this issue closed as quickly as possible. As I said above in reply to Duncan, I think this is a quick move for public relations purposes to ensure the team is distanced from the positive test. The rider admits everything and even handwrites a statement to say he acted alone. He could have confessed in private but the letter was written today and within hours put out into the public domain. – the team is named after a nationalist-type, Soviet song. Why? Is that smart in 2012? – Katusha is sponsored/run by several devious men (and a doctor with a criminal conviction). disasters at Gerolsteiner and Holczer’s blatant disregard for UCI’s request to “rest” Leipheimer? I have similar feelings about Astana; Kazakhstan is another former Soviet republic and Astana is no stranger to major scandal: kicked out of ’07 TDF, banned from ’08 TDF, multiple riders suspended for PED-use and the team failed to pay its riders during a 3-month period of 2009. [Two more formerly-guilty staffers with Katusha: Christian Henn, Head of Sports Department Sports Director and Erik Zabel, Coach & Sports Consultant. Henn’s quotes below are quite telling]. Surprisingly, Katusha’s website lists highlights of each DS and management also; describing Christian Henn’s cycling career, the site states, “No wonder that he was an important member of the Telekom wins at the Tour de France in 1996 and 1997.” (Bjarne Riis doped and won TDF in 1996 for Telekom and Jan Ullrich doped and won in 1997 — many Telekom riders were doped from ’95-’06). Henn was doped from ’95-’99 and retired in ’99 after testing positive for testosterone. “The times were like that. You couldn’t expect to keep up if you didn’t.” (Speigel International, May 23, 2007) Does Katusha think fans don’t read? It’s no surprise Henn was informed that former Soviet bloc countries were doping, as this was commonplace in specific sports during Soviet rule. The only way to compete was to also cheat. Do anything and risk everything, as long as it brings victories. cyclingnews.com, May 14, 2009) — this speaks volumes about Telekom’s long-standing approval of systematic doping of its athletes. Enter Bob Stapleton and they cut and run. In fairness I must mention Operation Puerto and the infamous Dr. Fuentes (a Spaniard), as it was one of the largest doping scandals in cycling history. China’s doping practices are long-lived, not unlike the Soviets and the East Germans. The pressure to use PEDs in cycling is well-documented in the literature. I do believe that some of the older generations involved in pro cycling (sponsors/owners, DS’s, management, doctors and some experienced riders, too) have carried their corrupt philosophies and practices forward to this day. They can have strong influences over young riders to do what it takes to win. Galimzyanov is considered the best sprinter in Russia. I don’t doubt for a second that Katusha, the Russian Global Cycling Project is involved in this latest doping case. We shall see. For me the bigger question is why they have a team doctor who is a “convicted criminal” as you claim? Why is this guy involved in cycling in ANY official capacity? Few (if any) of these pro riders are smart enough to design and implement a doping plan of much complexity all by themselves without getting nabbed, as Tricky Ricky Ricco so well demonstrated. If they can’t throw these crooked docs into the can or take away their license to practice medicine, the LEAST pro cycling should do is keep them the hell away from the teams and riders! How hard is it to simply implement a rule like this? I realize this is a sport where guys like Mr. 60% control teams but when is enough going to be enough? Eventually “one step forward, two steps backwards” means you end up going in the wrong direction, can nobody involved in the sport see the bigger picture here? Couldn’t agree more, Larry T. For any team to employ any personnel that have a criminal background is just blatantly dense. Sadly, Katusha has the feel of an old Soviet team using their athletes as scapegoats. Galimzyanov did not act alone, but he is likely under the “watchful eye…of Katusha mafiosi” as Ben states. No way a 25-year old performed EPO microdosing and [possibly] blood doping without the medical/science expertise of a doctor or someone experienced with this. I do believe that it is probable that the older generations of doctors and management are pressuring these young athletes to cheat. I blame “the brass” for corrupting the young minds of athletes who only want to experience success in a sport they’re passionate about. The Soviet Union may have collapsed in 1991, but the sport knowledge and philosophy of cheating without caring is still in the hands of the elders. Wiping this “cancer” out of cycling will be very political, but it’s about damn time! With the long history of the Soviet block/Moscow-Russia in the “race” for world super power, both on the political horizon AND in sport [most notably with the US], the fall of the USSR did not end the dreams and aspirations of those who lived under Soviet rule. It is here where I believe the elder “Soviets” still contain the willingness to risk cheating. The “fall guys” are their athletes who ultimately pay the price when caught. As Larry T. says, how difficult is it to at least keep these criminals off the payroll of professional cycling teams? To have any chance of running a clean team, you must start at the very top; hire professionals who have clean backgrounds, it’s not rocket science! I hope the investigation sheds a bright light on ALL who were involved, and if it does, ban them all from the sport of cycling, period. There does seem to be a lot of possibly subconcious use of language from Soviet times in use, parallels with the Zinoviev letter leap out. There does seem to be a lot of possibly subconscious use of language from Soviet times in use, parallels with the Zinoviev letter leap out. 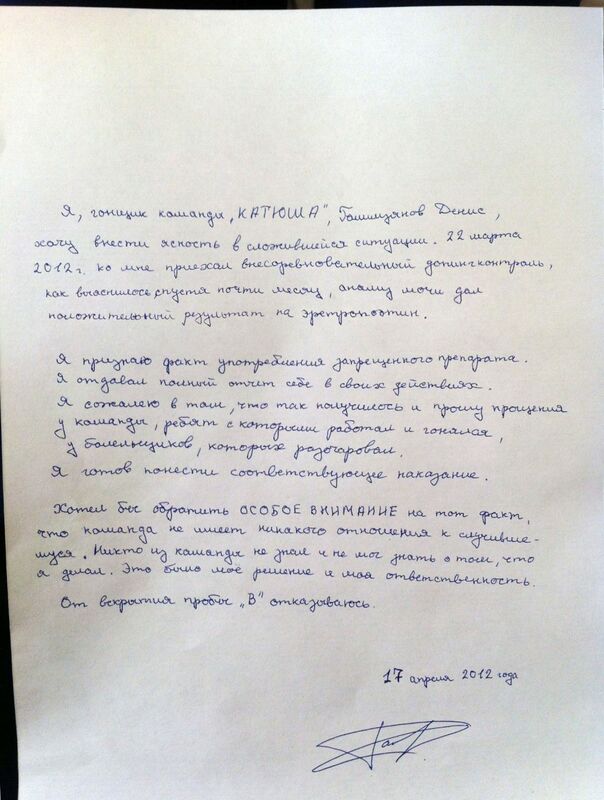 This handwritten note conjures up the image of Galimzyanov being dictated his own “confession” under the watchful eye of some uncompromising Katusha mafiosi. Ever so convenient for the Katusha team to be absolved of any involvement by Galimzyanov! Tha’s exactly how I saw this. When discussing Kolobnev’s diuretic positive with Katusha DS Dima Konyshev on the rest day at the Tour de France last year, he shrugged and said he “can’t understand it; Alexander is very profi” – meaning he’s a true professional. What I took him to mean wasn’t that Kolobnev was resolutely clean but that he ought to know how not to get caught. I shuddered when he said “we will see what will happen to him…” and could easily imagine Dima and Tchmil holding the 400w light into poor Alex’s eyes whilst they help him with his story. It’s long been the case in many teams that riders are told to “prepare” but given clear warnings that if they are caught, they’re on their own. This is why many cycling fans see the teams denouncing the rider as suspicious. We cannot infer anything yet over Galimzyanov but a team that really cared about riding clean and supporting its riders should be saying “wow, we’re sorry, we failed. How did this happen, why did he feel the need to do this, we gave him the best support possible” rather than “nothing to do with us”. Sort of the anti-Highroad team, ah! It’s just sad really. This sport is struggling for market share and sponsors and drugs is going to kill any hopes of making inroads into either one. One would think that this would be painfully obvious to everyone in the sport by now. To be honest, I think that if the focus was on some other sports (football, tennis etc), the world would see that cycling is not alone as far as the problem of drugs in sport goes…. Furthermore, this story of a fairly low profile rider getting caught should rate as a very small blip for people outside of cycling compared to the Contador story, which naturally made mainstream media headlines. I have no idea what those vested interests might be, but I agree it would be very naive to think that any sports with similar physical demands (be it strength or endurance) would be cleaner just “because”. Quite the contrary, my firm opinion is that cycling is the cleanest sports out there, because nobody else is so hard with the athletes. The reason that there’s still so much doping really tells how much there is in other sports which don’t have the bio passport, the hotel raids and everything else. I wonder whether there is any (unofficial) agreement that after his ban he will be offered a new contract by the team (as long as he doesn’t implicate the team in any way of course — if they even knew about it). Remember how long it took for Kolobnev to sign after he was free to race again? I think that today with internet it’s very easy to say that you have acted alone. Just googled EPO and you get numbers of pages selling and teaching how to use it. Off course this can be used and it’s hard to denied. What do you think? Sure a professional “smart” guy wouldn’t use EPO just googleing, and will at least contact a “doctor” to help in out, but I don’t think this guy will open his mouth and tell the whole story. Exactly but at least he could explain why he decided to buy it from the internet, how much he paid and whether he was taking any steps to hide it. Plus if he tested positive on 22 March he must have injected the product soon before this date. Where was he? At home? With the team? Is the possibility of a plea bargain – providing worthwhile information on practices, techniques and the machinery of doping (teams & doctors) – for a reduction in sentence too far beyond the culture of silence to be taken seriously by the doping authorities? I suppose it depends what is promised in return for loyalty to the team? It seems that once again the doctors are ahead of the authorities and other riders, teams and fans are being cheated. Galimzyanov cocked up and got caught – maybe he didn’t follow the instructions properly – but who is giving the instructions – because with guaranteed testing you’d have to be pretty certain of your doping programme to even try it which points to sophisticated professional assistance. No one in my office has come to me yet with “news” of the doping story so it’s definitely not hitting the mainstream, “all cyclists dope” media yet. Everyone knows of my cycling love so when it crosses over to mainstream, coworkers all try to be the first to tell me the story , not realizing of course I already got the Inrng tweet. Not great news to wake up to. I liked him. He’s been Katusha (in whatever iteration) since the beginning, right? So what does this say about their culture on doping starting at the earliest levels? Have to agree that the letter just seems creepy, old school Soviet. In whatever Itera-tion – Was that a cunning play on words??!! I should say yes, absolutely planned, but no, definitely not that clever. Kind of surprised someone on here hasn’t ever made that jump before. “It is rare for a rider to act totally alone here”. Most certainly. But I am afraid Galimzyanov has already stated the opposite, if my Russian is correct: “no one in the team knew, or could have known, what I was doing. It was my decision and my responsibility”. I guess he’ll take his 2 years, some money will be returned to the team, or will appear to be returned, and that’s it. Great victory for BMC today in Trentino, and Julien Simon is my guess for the Flèche(double feature tomorrow!). Denis’ written confession will hopefully take a back seat to a thorough investigation. Like several have already stated, it is likely that someone in Katusha’s management “stood over him” while he wrote this personal divulgence of guilt. If he was pressured to cheat and pressured to accept solo responsibility if caught, then he will likely harbor anger towards those who led him down this path. I can only imagine how panic-stricken he’s gonna feel when he realizes the total consequences of the actions, be they the ultimate fault of those who say they have his best interest in mind [Katusha]. After his two-year ban, his name will be tainted like many, and signing a new contract will probably be even more difficult in 2014. Of course, the fault lies both with Galimzyanov and whomever taught him how to cheat. Does integrity exist anywhere in Katusha’s staff? My (naive) hope is that this case is the one which finally highlights the beginning of the end for the RGCP management [that is if Katusha personnel are indeed responsible for Galimzyanov’s cheating]. Sadly, politics will play the biggest role in how things shake down. These written confessions and ‘rider acting alone’ scenarios are far too convenient and common place. Surely there should be some sort of rule in place where a team has a certain number of strikes then IT has to be investigated for its anti-doping governance rather than just the rider. It’s too easy to continually trot out the bad apple excuse and let the teams go on their merry way, especially for squads that have housed multiple offenders in a relatively short space of time. It’s been said time and again, but cycling needs to confront the network enabling the doping rider and not just the end user, who is a partly unfortunate victim in all this. This whole episode feels like a confession a mob hitman or bagman would make to ensure he or his family are safe (and he would be able to return to “task” once he did his time). Remember – the Russians since Putin took over has been quite active in alleged poisonings etc..in London as well as allegedly poisoning of Yushchenko of Ukraine. That’s a bit unfair to the Russians. Whilst this team is very much team Kremlin and there are some shady links that others have alleged, it’s still a cycling team. “Rider caught taking EPO” is not very Russian. The thing with doping doctors – we sort of assume that they are some kind of cycling equivalent of the neighborhood pusher, coercing riders into doping. However, that seems a little simplistic and certainly isn’t borne out by the various books and first-hand accounts that are in the public domain. I can see it being quite likely that a doctor might have helped a rider who demanded dope during, say, the 90s but who might have cleaned up the act since. I can also see it being possible that riders who might have doped 5-6 years ago are now cleaning up their act in keeping with the times. And it is quite likely that these doctors were hired for reasons other than their dope-administering skills. They may also be qualified sports doctors (in fact, I’ll suggest that a doctor who is on the cutting edge of doping is probably on the cutting edge of legal performance enhancements as well). I find this whole inference of guild merely because “he was in charge of Team X when a doping scandal erupted” to be a little too simplistic. (This isn’t really aimed at this post in particular. I am referring to the snide allegations that seem to crop up every time a rider does well. Cancellara in 2010, Gilbert last year and now Boonen. I think you pointed out in one of your Twitter updates that “guilt by past association” covers pretty much the entire cycling industry). You guys went to town on the Kremlin angle. I’m all for some intrigue but I don’t know how cold war this whole scenario gets. It’s appears very simple to me. Dude is playing high stakes and crapped out. He knows how the game is played. Time to sit down for a bit while others get to play. The old boss man will throw him a little jobby job tickling the ivories in a petro hotel of the future so he can stay fit and we’ll see him Pro Conti in a few years then back up the ladder. Let’s also keep in mind that geographically speaking Gman has exactly one option to get back to the big show. No other team will touch him as they most probably are thinking what most of you said x10. The silver lining for the Gman is the Mr. Marakov prints money as a hobby. How many other owners can sort a guy out in the real world post racing? Bike shop jobs don’t count either. I do find the acceptance of responsibility refreshing regardless of agenda. Maybe the written confession is the quickest way to move on, and minimize damage on many fronts. We know all to well the stories of the high profile American riders that spent most of their accumulated wealth on a wasted defense strategies (perhaps at the encouragement of legal counsel, who were billing by the way). Why drag it on? It seems that quick admission of guilt (and hopefully not a “forced” confession) bodes well with the governing body. Do the suspension then return to cycling. Goodness, there are at least 20 pros riding now that have been suspended previously for some form of PED offense. I agree, the “mobsta” and “commie” stereotypes being projected aren’t really necessary. Perhaps better to frame this as just another case of a rider getting caught, regardless of nationality or domicile. Those lawyers working on the high-profile American cases weren’t doing it for direct payment for services, as those dopers were far from rich. The “fairness fund” angle was little more than a shield to hide this from the public. Their mission was to use those cases to defeat the WADA and USADA. This would then open up very lucrative opportunities for them defending other (much richer) cheaters in the future. Landis and Hamilton were little more than pawns in their game. They were used by the lawyers as much as they were used by the various cycling teams they raced for. I have a feeling Holczer’s head will roll this time. One thing I should add is that he’s been labelled as “Russia’s top cyclist” by the media in Moscow. This is not playing too well domestically for the team, it’s been on TV bulletins. He might not be a big name in the sport but amongst Russian riders he was a big fish and someone improving and seen as a prospect for an Olympic medal. That’s one perspective anyway. I didn’t see the medal chances and the media seem to have forgotten Menchov. Can I mention threshold doping? We cycling fans are told that the testing regime in cycling is the best and most intrusive in the world. If we accept that premise then so must riders, who know that they face tough testing and possible detection. Why would anyone want to take too much dope so as to test positive, especially when given the right medial attention any sports person can “threshold” dope so as to take some advantage without going over accepted levels. There’s an interview with Michael Ashenden somewhere on the web (i’m not sure where perhaps someone knows….) in which he says that nowadays EPO use is as a mask for transfusions: something to do with transfusions giving you a higher red blood cell count and the presence of EPO preventing more red blood cells being made, or something like that anyway. He also says it is by no means an exact science. So its quite possible that he has done this and made a miscalculation and got caught above the threshold. However a transfusion also implies that he had help doesnt it? Surely you cant do a transfusion, storing the blood, reinjecting it on your own – safely? It sounds like this would be a big risk. Especially after Ricco. I’m not sure blood trasfusion, storage or reinjection are per se dangerous (this is, by the way, be the crux of the Fuentes case in the Spanish courts). Not sure either that moderate amounts of EPO are bad for the health. Pretty sure, on the other hand, that blood management has become an integral part of athletic preparation, ever since soccer megastar Beckenbauer was advocating transfusions in the early 70s. The problem is how to regulate it in a way that is fair, non-intrusive, and easy to enforce. But the “ban-everything” approach won’t work. I’ll argue the other side of this idea. I don’t think danger or lack of it is a good reason to make rules. Of course I’d certainly not want some young kids to be fooling around with this kind of stuff in the garage as the “if some is good, more MUST be better” examples are out there – how many young riders went to sleep and never woke up in the early EPO days? The real issue is, blood transfusions are against the RULES. Using a motorcycle is against the RULES. Hanging onto the DS’s car is against the RULES. The WHY doesn’t matter – ALL of these rules are agreed-upon in advance handicaps or inefficiencies – they’re what make bicycle racing a SPORT. Certainly enforcing a rule against blood transfusions is more difficult than the other examples, but is that reason enough to toss the rule and let ’em transfuse? They once let ’em EPO themselves up to 50% hematocrit because they had no test for EPO….how well did THAT work? The guys who didn’t want to risk their health by doping up to 50% found it tough to compete. Should they be told “too bad”? Should they also let Cavendish hold onto the car up the climbs in LeTour because it’s too difficult and expensive to monitor this behavior, perhaps with a camera on ALL the sprinters? It’s impossible to monitor everyone all the time, but that to me is no reason to water-down or toss out rules. Toss out the cheaters instead – lifetime ban unless you rat EVERYONE out. 2-4 years if your information is truthful and results in more cheaters being tossed. 2 years (or less) just isn’t enough of a penalty when you can cop to it like this Katusha guy has and (likely) come back as if nothing ever happened. I think we’ve discussed this before, but it’s not bad to touch base again. 1) Sport was cycling when caffeine was forbidden beyond a threshold, sport it is now with the caffeine-bar open, and sport it was long before anti-doping controls. I don’t recognize anti-doping crusaders the monopolistic right to define what the “spirit of sport” is. 2) Sport it was when derailleur gears were forbidden, and sport it is with electronic shifting. I prefer the former, but I admit that rules can and do change. I wouldn’t want cycling to be too deletereous for the health or “too pharmaceutical”, but keeping limitations there, just for the sake of keeping limitations, regardless of how easy and effective they are to enforce, and their impact on riders’ health, makes no sense in my mind. 3) I’m not sure how many died of EPO, and after reading Verner Moeller, I’m not even sure any did at all (and those deaths can easily be attributed to unprofessional, de-medicalized handling and dosing), and I’m pretty sure that a number of deaths the media and authorities have historically attributed to doping were probably due to other causes. 4) The 50% hematocrit was at least clear and easy to measure (it would be even easier nowadays). Too bad they only tested it at the beginning of the GT (except of course, Pantani’s case in the Giro). If they did that test to everybody, every race day at the moment of signing, it wouldn’t be bad (but it would be expensive, I guess). 5) I think hanging onto the car should continue to be banned, and should be monitored more closely (you don’t need to be a doctor for that, and I personally would do it for free in any major race). We should draw a line at the skin of the rider: any mechanical (in the physics sense of “mechanics”) help outside the skin is cheating. What happens inside the skin is a different matter, where natural and artificial and not necessarily possible to tell, and less and less so, especially as progress allows technology to replicate nature. Do your homework and back up your statements with credible sources. Please don’t assume the Katyusha name has any dark overtones. Firstly it is a pet name for anyone called Ekaterina and, having run a confectionery company where we used Katyusha as the brand name (after my partner’s daughter), I can assure there is nothing sinister in its use!! Wonder if the confession absolving the team and managers was coerced. Blimey, this one has set the wires on fire! Just a word: I’m not sure Galimzyanov can really be called “a fairly low profile rider.” He was Russia’s big hope for the Olympic road race, he’s had first Cipo and then Zabel contracted to school him (they can’t come cheap), Astana have been fielding all-Russian teams to find the right combination of riders to support him in his Olympic bid. In short, he has been at the centre of a massive and costly project for some years now. In other words, he has been under astonishing pressure. I’ve always found him likeable and naive: admittedly, I don’t have fluent Russian. But I do feel rather sorry for him, a young man in a difficult position at a time when the quality of sprinters at the top end has never been higher: Cav – perhaps the best in history – but also the legions of differently-talented fast-twitch monsters from Greipel and Kittel to the likes of Guardini, Degenkolb and Viviani. Who’d be a sprinter these days? In other words, stick with Inner Ring’s careful line here: don’t shoot the rider. He’s just a young man who knows nothing but cycling – and may lack either good advice or the character to take it. Inner Ring, it’s not just your problem to deal with – it’s the entire cycling culture, including myself. Winning at all costs influences rider opportunity, team director priorities, sponsor marketing agendas driven by the need for public attention. All of us need to remember the process and not just focus on the results. In this forum at least there are many who love the sport and all its participants; the winners make a good story but there are a lot of other stories in the peloton too and this is recognized here. Kudos. So to tie that with the other thread re: Moneyball. Big money did not improve this rider’s opportunity – he still doped. His big money team seems focused on the ends not the means; arguably those ends may have little to do with cycling given the sponsor agenda. The process got the rider instead of aiding him because process was ignored. Will punitive measures do its job as a corrector of behavior? We shall see. Meanwhile, we can do our part. All of us improve the process when we do our parts as individuals in the culture to focus yes on the excitement of winning but also on the stories and people behind the entire peloton, including the lanterne rouge. You as a journalist/social influencer, me as a coach, your readers in their roles. We can make it better, one life at a time. Whilst it’s a convoluted way to achieve it, at least Galimzyanov’s suspension solves Katusha’s problem with its (one too many) team list. Sad, sorry nonsense. If you believe half of this story then you’ll probably also believe that the earth is flat and the moon is made of cheese. No-one short of a trained doctor can use these drugs on their own safely. They are nasty, tricky substances. Where there is smoke, there’s fire. This is a cover-up only the Marx Bros (pun intended…..) could have dreamt up. Pathetic.